As they say, ‘When in Rome, do as the Romans do’. Well, when you are in Barnet, you should do as the British do, and that does not necessarily mean scoff at people. Or sit in confined spaces and drink hot water. Okay, just go out and have fun. Here’s some places to go to. 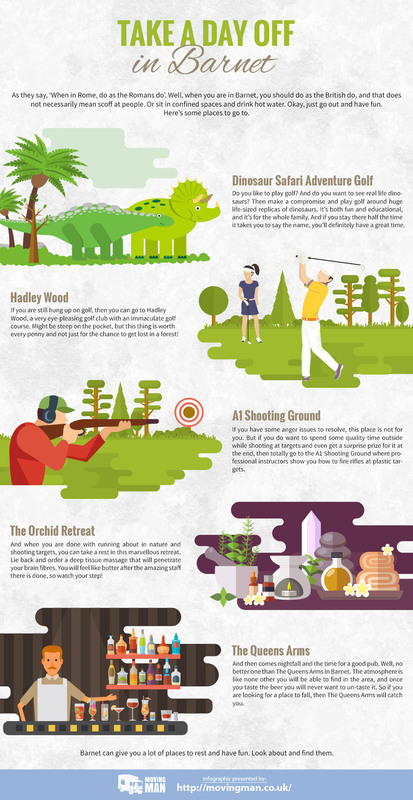 Do you like to play golf? And do you want to see real life dinosaurs? Then make a compromise and play golf around huge life-sized replicas of dinosaurs. It’s both fun and educational, and it’s for the whole family. And if you stay there half the time it takes you to say the name, you’ll definitely have a great time. If you are still hung up on golf, then you can go to Hadley Wood, a very eye-pleasing golf club with an immaculate golf course. Might be steep on the pocket, but this thing is worth every penny and not just for the chance to get lost in a forest! If you have some anger issues to resolve, this place is not for you. But if you do want to spend some quality time outside while shooting at targets and even get a surprise prize for it at the end, then totally go to the A1 Shooting Ground where professional instructors show you how to fire rifles at plastic targets. And when you are done with running about in nature and shooting targets, you can take a rest in this marvellous retreat. Lie back and order a deep tissue massage that will penetrate your brain fibres. You will feel like butter after the amazing staff there is done, so watch your step! And then comes nightfall and the time for a good pub. Well, no better one than The Queens Arms in Barnet. The atmosphere is like none other you will be able to find in the area, and once you taste the beer you will never want to un-taste it. So if you are looking for a place to fall, then The Queens Arms will catch you. Barnet can give you a lot of places to rest and have fun. Look about and find them.